Learn how to create beautiful sculptures to express yourself when you attend one of the art lectures and workshops from Pinkie’s Art from Fuquay-Varina, North Carolina. Learn how to tell a story through art with Pinkie, an fine artist, as your guide. Learn more about the history of Pinkie’s unique sculptures and paintings when you attend one of her hour long adult and child-friendly lectures. During the lecture, she shows various slides of her work. Learn how to build your own unique sculpture and tell a story using art as your catalyst when you attend one of her 2-hour long workshops. Classes take place in her studio and hold a small group up to 15 people. Pinkie is available to host workshops at other locations, upon request. 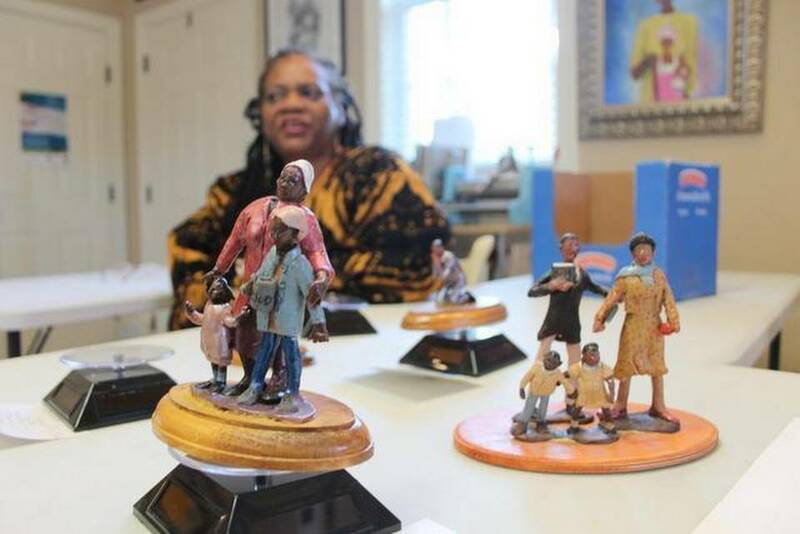 Pinkie Strother and daughter, Stroria Strother-Davis founded “Mother & Daughter Art” (Pinkstro) in 1993, after Stroria earned her BA in Art from Morgan State University. Stroria developed a keen business sense while working at an art center during her high school and college years. Upon graduating from Morgan, she increased her expertise in art through many experiences and venues. Jewelry, drawings and paintings became her main attractions. In 2004 Stroria moved her business to Fuquay Varina, NC and was joined by Pinkie in 2006. Pinkie Strother holds a BA in Art from Bowie State University, and a MFA from the Maryland Institute Collage of Art. Pinkie has taught art on all levels (i.e. college, high school, middle, and elementary). After having taught in Maryland for 33 years, Pinkie continues her art career in North Carolina. Together Pinkie and Stroria have journeyed through many art endeavors. A mother daughter art exhibition has been on going since the early 90’s. Pinkie and Stroria have embarked on many joint projects including wall and floor morals, custom interior projects, creative workshops, art lectures, custom paintings, books illustrations, gallery exhibitions and many festival showings.